In 1637 the first English settler in the Salisbury-Amesbury region, John Bayly, crossed the Merrimack River from the new settlement at Newbury, built a log cabin, and began to clear the land for cultivation. He intended to send to England for his wife and children, but they never did rejoin him. He and his hired man, William Schooler, were arrested shortly for a murder Schooler had committed. The latter was hanged for it. Bayly was acquitted. Given the fishing rights on the river by the subsequent settlement, provided he would sell only to it, he abandoned agriculture for fishing. On September 6, 1638, the General Court of Massachusetts created a plantation on behalf of several petitioners from Newbury, on the left bank of the Merrimack, as far north as Hampton, to be called Merrimac. They were given permission to associate together as a township. Middens of shells and arrowheads marked the former locations of native villages. They had fallen victim to smallpox. The area remained in possession of the tribes along the Merrimack, who hunted and fished there. The settlers formed a militia to counteract the possible threat of conflict. One especially abundant site of middens at the top of a hill, from which a river cascaded, was called by the settlers Powawus (Pow-wow), from the native congress believed to have been held there, and the river, the Powawus River. The hill is part of the left bank of the Merrimack and the river originates in New Hampshire. Today this cascade, sometimes called falls, remains sunken in an urban environment, from which it tends to collect debris. The settlers of the plantation, who entered Massachusetts Bay Colony through Newbury, were rebels in a cause shortly to be settled by the English Civil War (1642-1651). Although nominally subjects of the crown, they did not in any way obey it. They did maintain close ties with the Parliamentary cause in Britain. The supreme government of the colony was the General Court, which functioned autonomously, passing its own laws, establishing courts, incorporating townships, assuming the power of life and death over its colonists and providing for the overall defense of the colony. They established a Puritan church rather than the Church of England, enforcing this establishment with severe penalties. In the early spring of 1639 about 60 planters took up residence on land cleared by the natives. In May an elected planning committee of five laid out the green, the initial streets, the burial ground, and especially the first division into lots, apportioning the size of a lot to the wealth of the settler. On September 4 the General Court named the town Colchester, but in October changed the name to Salisbury, probably at the instigation of Christopher Batt, from Salisbury, England. A soldier, he trained the first militia. In November the General Court appointed a government of six, which required that every lot owner take up residence on his lot. They began to assign lots west of the Pow-wow river. On October 7, 1640, the General Court incorporated Salisbury; that is, it granted legal recognition by the colony to a township of that name, with its own government, empowered by citizens populating a territory of legally defined boundaries. The original Salisbury was many times larger than the present. From it several townships were later separated. On January 12, 1641, a town meeting ordered the first roads north and west of the Pow-wow to be laid out. On April 21 another meeting granted to William Osgood 50 acres of "upland" and 10 of "meadow" along the Pow-wow provided he build the town's first sawmill. It utilized a water wheel driven by the Pow-wow. The mill produced lumber for local use, but also pipe-staves for export. In these times before the separation of Newburyport and the opening of Newburyport Harbor by dredging a new channel, the export route ran down the Pow-Pow, across the Merrimack on a ferry where the public landing now is, over Ferry Road, partly abandoned as Old Ferry Road, and along what is now High Street, Newburyport, to the docks of the Parker River near Lower Green, Newbury. A gristmill was added to the Pow-wow river location in 1642. The 90-foot (27 m) drop of the Powwow River provided water power for a subsequent mill complex. In 1642 also the town ordered 30 families to take up residence west of the Pow-wow and form a "New Town." No volunteers responded. However, this date, the first legal recognition of a municipal entity on the site of Amesbury, is termed its "settlement" by many sources. On May 10, 1643, the General Court divided Massachusetts Bay Colony into four shires: Essex, Norfolk, Middlesex and Suffolk. The choice of these names was etymologic relative to Boston (Norfolk is "North Folk," etc.). Norfolk contained Salisbury, Hampton, Haverhill, Exeter, Dover, and Strawberry Bank (Portsmouth), none of which had exactly the borders they have now. This division was a legal convenience based on the distribution of courts. Since the first establishment of four courts on March 3, 1635, the General Court had found it necessary to multiply and distribute courts, so that the magistrates would not spend time in travel that they needed for settling case loads. The main requirement for membership in a shire was incorporation. Private occupation of the west bank of the Pow-wow went on as East Salisbury citizens sold their property and moved to New Town. However, New Town remained a paper construct without enforcement. On January 14, 1654, articles of agreement adopted at town meeting divided Salisbury into Old Town and New Town, each to conduct its own affairs. The border was the Pow-wow. The agreement went into effect on January 19, 1655. In New Town a new government was voted in, which claimed authority over "all matters of publicke concernment." They still paid taxes to Old Town and expected services from it. The board of Old Town contained some members from New Town for fair representation. This agreement also was known as a "settlement", but not in the sense of occupying land, which was already occupied. On May 26, 1658, New Town petitioned the General Court for independent town status. However, Old Town reneged on the settlement. The petition was denied. The issue focused on religion. The law established the Congregational Church, which meant attendance was mandatory, on penalty of a fine for each missed meeting, and the church and preacher must be maintained from taxes. Old Town simply could not afford to lose the taxes to a new church. Minister Joseph Peasley of New Town and his congregation attempting to defy the General Court were summoned into District Court at Ipswich "to answer for their disobedience" and were fined there. Peasly was enjoined from preaching. The issue dragged on. Another petition was denied in 1660. The burden of attending church several miles away became so great that New Town built a new meeting house and requested the General Court to find a preacher. The court yielded to the petition of 1666, granting the "liberty of a township" to New Town. The town was unofficially incorporated; that is, a government was constituted and officers elected, on June 15. It was named New Salisbury, but in 1667 the name was changed to Amesbury on the analogy of Amesbury, England, which was next to Salisbury, England. This basis is unrelated to any etymology of the two names. 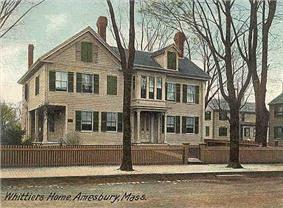 Amesbury was officially granted incorporation under that name on April 29, 1668. By then the days of unquestioned Puritan power were over. The English king had been restored in 1660, followed by the execution of the leading Puritans as regicides and an attempt to bring the Puritan colony under control of the crown. Charles II attempted to take more of a role in colonial affairs, generally without success. The long struggle between the royalist governor and the General Court began, that court losing much of its power. They were preoccupied for a time by King Phillips War (1675–78), the last maximum effort by the natives to rid themselves of the Yankees. At the end of it the creation of the Royal Province of New Hampshire took away several towns in northern Norfolk shire, brooking the power of the General Court. Massachusetts was reduced in size from most of New England to roughly its current borders. The Court now dissolved Norfolk Shire, transferring Salisbury and Amesbury to Essex County. The issue was by no means settled; the previous northern Norfolk Shire changed colonies a few more times before finally voting to stay in New Hampshire. In 1876 Merrimac was created out of West Amesbury. 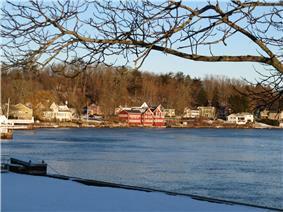 In 1886 West Salisbury was annexed to Amesbury, unifying the mill areas on both banks of the Pow-wow River. Beginning as a modest farming community, it developed an aggressive maritime and industrial economy. Shipbuilding, shipping and fishing were also important. The ferry across the Merrimack River to Newburyport was a lively business until the construction of bridges to Deer Island. 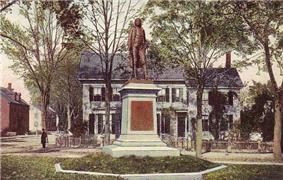 Newton, New Hampshire, was set off from Amesbury in 1741, when the border between the two colonies was adjusted. In the 19th century, textile mills were built at the falls, as was a mechanized nail-making factory, believed to be the nation's first. The Merrimac Hat Company produced more hats than any of its competitors. Beginning in 1853, Amesbury became famous for building carriages, a trade which evolved into the manufacture of automobile bodies. The industry ended with the Great Depression. Amesbury also produced Hoyt's Buffalo Brand Peanut Butter Kisses. Newspapers in the 19th century included the Amesbury Daily News, Merrimac Journal, Morning Courier, Evening Courier, New England Chronicle, Transcript, and the Villager. Newspapers in the 20th century included the Amesbury Advocate, Amesbury News, Amesbury Times, and Leader. In 1876, the town of Merrimac was set off from Amesbury. In 1996, the town changed its status to a city, and adopted the mayor and municipal council form of government, although it retained the title "Town of Amesbury", as voters "thought Amesbury was too small and quaint to be a city". Voters approved a charter amendment in November 2011 changing the city's official name to the "City of Amesbury" and removing references to the old "Town of Amesbury" name. The city's seal still bears the name "Town of Amesbury", although the City has put forth a bill to correct the seal with the new name. The community has an impressive collection of early architecture, particularly in the Federal and Victorian styles. Following a recent restoration of the historic downtown, many new restaurants opened. The "Doughboy", a memorial sculpture by Leonard Craske, stands on the front lawn of the Amesbury Middle School. It was dedicated November 11, 1929. Craske is best known as sculptor for the "Fishermens' Memorial" in Gloucester. There is here a monument erected to Josiah Bartlett, who was born in Amesbury. 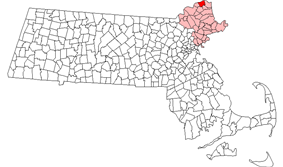 Amesbury is located at . According to the United States Census Bureau, the city has a total area of 13.7 square miles (35.5 km2), of which 12.3 square miles (31.8 km2) is land and 1.5 square miles (3.8 km2), or 10.65%, is water. Amesbury is drained by the Powwow River. Powwow Hill, elevation 331 feet (101 m), is the highest point in town. Once the site of Indian gatherings, or "powwows", it has views to Maine and Cape Ann. Amesbury is the second northernmost town in Massachusetts, its northernmost point coming just south of the northernmost point of the state, in Salisbury. Amesbury lies along the northern banks of the Merrimack River and is bordered by Salisbury to the east, Newburyport to the southeast, West Newbury to the southwest, Merrimac to the west, and South Hampton, New Hampshire, to the north. The Powwow River bisects the town, joined by the Back River near the town center. The river flows through Lake Gardner and Tuxbury Pond, which are two of several inland bodies of water in town, including Lake Attitash (which is partially in Merrimac), Meadowbrook Pond, and Pattens Pond. Several brooks also flow through the town. Amesbury has a town forest, which is connected to Woodsom Farm, as well as Powwow Conservation Area, Victoria Batchelder Park and Amesbury Golf & Country Club. Amesbury is served by two interstate highways. Interstate 495 runs from west to east through town, ending at Interstate 95 just over the Salisbury town line. It has two exits in town, Exit 54 at Massachusetts Route 150 (which lies entirely within Amesbury, and leads to New Hampshire Route 150) and Exit 55 at Massachusetts Route 110, which also provides the town's only direct access to Interstate 95 at Exit 58. I-95 crosses the southeast corner of town, entering along the John Greenleaf Whittier Memorial Bridge, a steel through-truss bridge crossing the Merrimack River. The Whittier Memorial Bridge lies just west of the town's only other bridges across the Merrimack, the Derek S. Hines Memorial Bridge, which connects Amesbury to Deer Island (which is still part of Amesbury), and the Chain Bridge, the only suspension bridge in Massachusetts, which spans from Deer Island to Newburyport. The current version was built in 1909, but was predated by the 1810 suspension bridge, one of the oldest suspension bridges in the country. The Chain Bridge and its counterparts over the years have been the main entryways into town across the Merrimack, and until the building of the Newburyport Turnpike Bridge, it was the easternmost bridge on the Merrimack River. MVRTA provides bus service in Amesbury. Route 51 connects to the Haverhill train station. Route 54 connects to Newburyport train station. As of the census of 2000, there were 16,450 people, 6,380 households, and 4,229 families residing in the city. The population density was 1,326.3 people per square mile (512.2/km²). There were 6,623 housing units at an average density of 206.2 persons/km² (534.0 persons/sq mi). The racial makeup of the city was 97.2% White, 0.6% African American, 0.22% Native American, 0.9% of the population were Hispanic or Latino of any race. There were 6,380 households out of which 34.5% had children under the age of 18 living with them, 51.2% were married couples living together, 11.3% have a woman whose husband does not live with her, and 33.7% were non-families. 26.8% of all households were made up of individuals and 8.9% had someone living alone who was 65 years of age or older. The average household size was 2.52 and the average family size was 3.09. In the city the population was spread out with 26.1% under the age of 18, 6.1% from 18 to 24, 33.8% from 25 to 44, 22.0% from 45 to 64, and 12.0% who were 65 years of age or older. The median age was 37 years. For every 100 females there were 93.1 males. For every 100 females age 18 and over, there were 89.7 males. The median income for a household in the city was $34,906, and the median income for a family was $62,875. Males had a median income of $25,489 versus $31,968 for females. The per capita income for the city was $23,103. 5.9% of the population and 3.9% of families were below the poverty line. Amesbury's high school football rival is Newburyport; the two teams play against each other every Thanksgiving Day. As of 2012, the Amesbury Public Library pays for access to information resources produced by Brainfuse, Cengage Learning, EBSCO Industries, LearningExpress, Library Ideas, Mango Languages, NewsBank, Online Computer Library Center (OCLC), ProQuest, TumbleBook Library, World Book of Berkshire Hathaway, and World Trade Press. New England Sports Park, formerly Amesbury Sports Park, is a recreational facility located in Amesbury. The first known reference was as a ski area called Lone Tree Hill in 1949. Lone Tree Hill featured a wide slope serviced by a 1,000-foot (300 m) rope tow. It is unknown when the ski area closed. It was later opened on this same hill. The snow tubing facility features snowmaking and night lighting. Multiple fields at the base of the hill allow for off-season activities such as soccer, rugby, extreme obstacle races such as the Spartan Race, Color Run and Warrior Dash, concerts, and a Brew Fest. Amesbury Carriage Museum, 270 Main St.
Amesbury Friends Meeting House (1850), 120 Friend St.
Bartlett Museum, Inc. (1870), 270 Main St.
John Greenleaf Whittier House, 86 Friend St.
Macy-Colby House (c. 1654), 257 Main St.
Salisbury Point Railroad Historical Society, 9 Water St.
Amesbury, England, 8 miles from Salisbury. ^ "Mayor's Office". Amesbury MA. Retrieved 21 September 2015. ^ Baker, Billy (6 November 2013). "Mayor loses by two votes in Amesbury". ^ a b "TOTAL POPULATION (P1), 2010 Census Summary File 1". American FactFinder, All County Subdivisions within Massachusetts. United States Census Bureau. 2010. ^ Merrill 1880, pp. 6–7. ^ Merrill 1880, p. 22. ^ Merrill 1880, pp. 5–6. ^ Merrill 1880, pp. 9–10. ^ Arrington 1922, p. 42. ^ Merrill 1880, p. 20. ^ Merrill 1880, pp. 24–25. ^ Arrington 1922, pp. 41–42. ^ Merrill 1880, p. 50. ^ Merrill 1880, p. 54. ^ Merrill 1880, p. 56. ^ Merrill 1880, pp. 60–61. ^ Merrill 1880, p. 91. ^ Boston Public Library, Microtext Department. "Massachusetts Newspapers". Newspapers on Microfilm. Retrieved 13 May 2012. ^ Rowell's American Newspaper Directory. NY: Printer's Ink Pub. Co. 1909. Retrieved 13 May 2012. ^ a b Cerullo, Mac (January 8, 2013). "'"Putting the seal on 'City of Amesbury. Newburyport News. ^ Laidler, John (November 13, 2011). "Incumbent mayors all keep seats". The Boston Globe. ^ "Geographic Identifiers: 2010 Demographic Profile Data (G001): Amesbury Town city, Massachusetts". U.S. Census Bureau, American Factfinder. Retrieved August 30, 2012. ^ Amesbury Public Library. "Downloads & Databases". Retrieved 13 May 2012. ^ Amesbury Public Library. "Local History". Retrieved 27 February 2013. ^ "Susannah Martin: Accused Witch from Salisbury". History of Massachusetts. Retrieved January 16, 2014. ^ "Josiah Bartlett". Independence Hall Association. Retrieved January 16, 2014. ^ "WINGATE, Paine, (1739 - 1838)". Biographical Directory of the United States Congress. Retrieved January 16, 2014. ^ "BLAISDELL, Daniel, (1762 - 1833)". Biographical Directory of the United States Congress. Retrieved January 16, 2014. ^ "Tour the Home". Whittier Home Association,. Retrieved January 16, 2014. 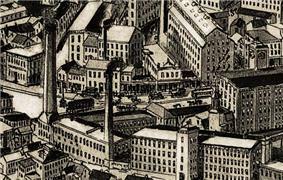 ^ "Currier & Ives - The History of the Firm.". The Currier and Ives Foundation. Retrieved January 16, 2014. ^ "AMESBURY, MASSACHUSETTS". Longyear Museum. Retrieved January 16, 2014. ^ "Harriet Elizabeth Prescott Spofford Collection". Five College Archives & Manuscripts Collections. Retrieved January 16, 2014. ^ Basic Books, Editors Of Perseus Publishing (2003). Movers and Shakers: The 100 Most Influential Figures in Modern Business. Basic Books. p. 266. ^ "James Henry Bannon". Baseball-Reference.com. Retrieved January 16, 2014. ^ Fagan, Deirdre J. (2007). Critical Companion to Robert Frost: A Literary Reference to His Life and Wor. Infobase Publishing. p. 412. ^ "Jeffrey Donovan 'Burns' hot". Miami Herald. Retrieved January 16, 2014. Arrington, Benjamin F., ed. (1922). Municipal History of Essex County in Massachusetts. Volume I (Tercentenary ed.). New York: Lewis Historical Publishing Company. Merrill, Joseph (1880). History of Amesbury Including the First Seventeen Years of Salisbury to the Separation in 1654 and Merrimac from its Incorporation in 1876. Haverhill: Press of Franklin P. Stiles. Amesbury Vital Records to 1849. Published 1913. Transcribed and put online by John Slaughter and Jodi Salerno. Merrill, Joseph, History of Amesbury, from the History of Essex County Volume 2 Chapter 125, pages 1495-1535, compiled by D. Hamilton Hurd, published by J.W. Lewis 1888. Sargeant, Christopher. 1794 Map of Amesbury. Clough, Aaron. 1795 Map of Salisbury. Nichols, W., J S Morse. 1830 Map of Amesbury. Anderson, Philander. 1830 Map of Salisbury. Beers, D.G. 1872 Atlas of Essex County, Massachusetts Amesbury. Plate 9. 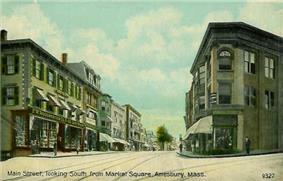 Amesbury and Salisbury Mills. Now Amesbury Center. Plate 12. Salisbury. Plate 15. West Amesbury now Merrimac. And East Salisbury. Plate 17. Salisbury Point. Plate 19. (Now The Point in Amesbury). Bigelow, E.H. Amesbury and Salisbury Mills. Bird's-eye view at the Boston Public Library website. 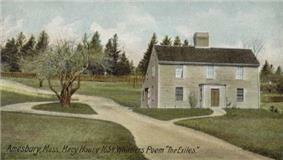 Norris, George E. : Amesbury. Panoramic View. Published 1890. Burleigh Lith. Est. At the Library of Congress website. Hughes & Bailey. : Amesbury. Panoramic View. Published 1914. Walker, George H. 1884 Atlas of Essex County Massachusetts 1884 Map of Amesbury. Plate 169. Amesbury,Salisbury Point. Plate 74. Merrimac Center (was West Amesbury). Plate 151. Amesbury Village Mills. Plate 170-171. 1884 Map of Merrimac. Plate 172. 1884 Map of Salisbury. Plate 175. Salisbury Village Mills on the Powwow River. Plate. 176-177. East Salisbury. Plate 178. Danvers Catholic Church, Folger's Carriage Factory Amesbury. Plate 166.